Big Island police are informing motorists that police will be conducting DUI checkpoints throughout the island in anticipation of the upcoming Halloween weekend. The effort is part of a national and statewide campaign called "Drunk Driving: Over the Limit. Under Arrest." Sergeant Kelly Ka’aumoana-Matsumoto, head of the Traffic Services Section, said police are reminding motorist of the consequences of impaired driving. Officers from the Traffic Enforcement Unit and Traffic Services Section were supported by the Traffic Safety Coordinator and the Mothers Against Drunk Driving (MADD) Program Coordinator, at a DUI checkpoint on Wednesday (October 27) in Hilo. They reminded motorists about the hazards of drinking and driving and gave them literature on the subject as well as safety tips for trick-or-treaters and motorists. 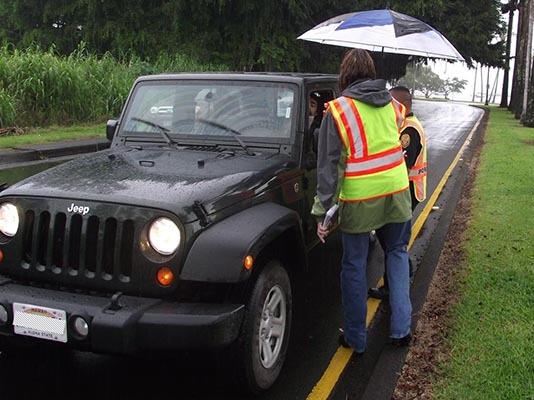 The checkpoint kicked off Halloween weekend enforcement efforts on the Big Island. Drunk driving has been responsible for more than half of the 23 traffic deaths so far this year. The 2009 traffic fatality count for Hawai’i County was 22 fatalities, which we have already surpassed this year. "Be especially careful in residential areas by slowing down and looking for keiki on roadways and shoulders," said Ka’aumoana-Matsumoto. "If you are drinking, please don’t drivealways remember to have a designated, sober and licensed driver before you start drinking, and if you can’t find one, don’t take a chance take a taxi!"